This is the fourth and final research note from Swati Janu, one of the researchers who received the Social Media Research grant for 2016. I am in Savda Ghevda, a resettlement colony over 30km north-west from Central Delhi and I am hungry. The summer sun is beating down on me and in the dusty horizon I can see the dystopian skyline of the empty EWS flats, slated for allotment since 2006. I trudge down the road to the nearest kirana store and buy a packet of Yellow Diamond chips and H2Go mineral water. 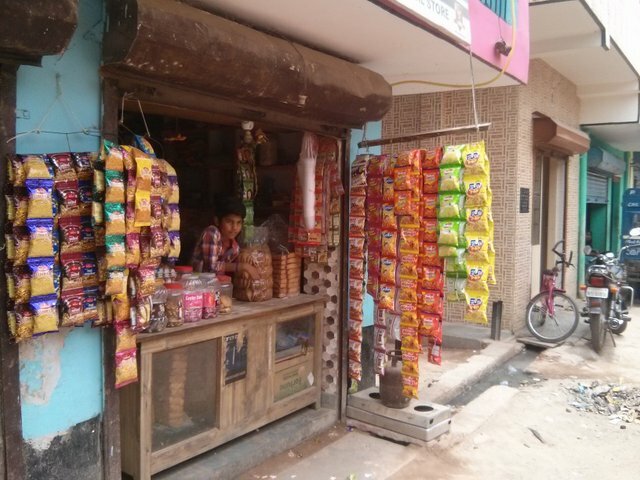 Packets of Diamond chips strung from store fronts are a common sight in Delhi’s peri-urban areas like Savda Ghevda or its dense informal settlements, but not in its formal colonies where larger brands such as Lays chips are found instead. The ‘pocket internet’ that thrives on small data recharge amounts for mobile phones that my previous posts have covered is marketed similar to the ‘sachet marketing’ of Diamond chips. Moreover, economic trends indicate that at least in rural India, these small but regular amounts being spent on internet have even begun to eat into the profits of consumer items such as chips and cold drinks. From the economics of pocket internet, this post looks goes on to look at infrastructure – of digital networks and basic amenities – through the example of Savda Ghevda. While most homes may have a Smartphone in this settlement far removed from the city centre, there is only one cellular tower here and hence, mobile connectivity is weak. Bright new red billboards advertise 4G Vodafone above the fronts of mobile recharge stores in an irony that is evocative of the erratic access to services in informal settlements in Indian cities. The post deconstructs the infrastructure here to present the insecurity the community lives in which can be seen to manifest in their economic decisions and the physical form of their settlement itself. Finally, I discuss how digital networks thrive within and despite the systemic shortcomings of informal settlements. Regional brands such as Pratap Snacks’ Diamond Chips are posing a serious competition to bigger brands by providing last mile connectivity to rural, semi-urban and dense urban areas where their products can be seen delivered even on cycles through narrow lanes. Instead of spending on advertising and marketing, they rely on localization and visibility. 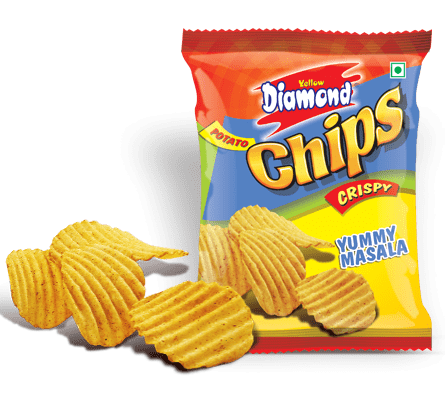 The curious case of Diamond chips’ huge success can be largely attributed to their sachet marketing of chips sold in the 5 to 10 Rs range with the 5 Rs packet segment driving most of the company sales. Similar to the network of phone recharge shops and agents of different mobile service providers covered in my second post, they distribute directly to local stores through ‘super-stockists’ or local distributor-entrepreneurs who pay upfront like the store owners. 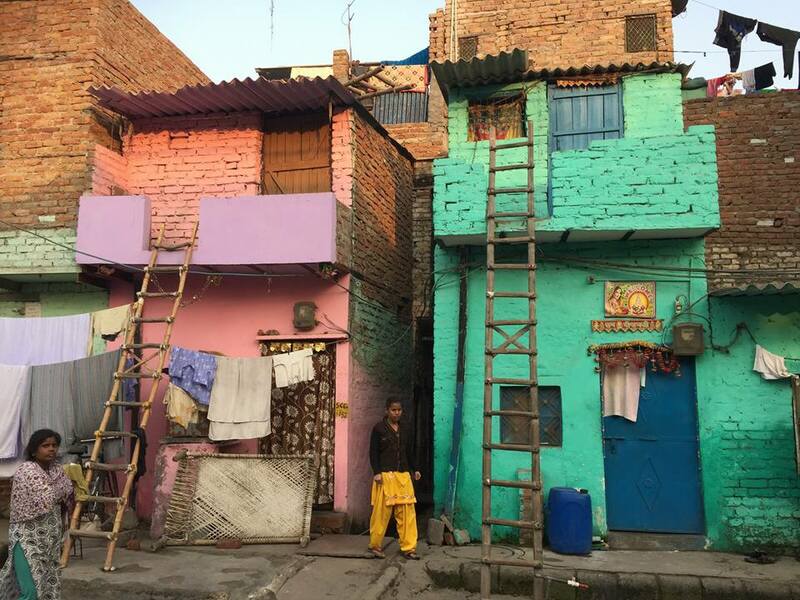 Pocket internet, the most commonly used form of mobile internet in informal settlements in Delhi, employs a similar strategy of ‘buying less, more often’. It is important to understand the economic context of this trend of buying small amounts again and again that describes the way digital media is consumed in informal settlements. The service providers understand this nature of consumption in lower income areas which ‘altruistic’ initiatives such as Free Basics have failed to take into account. From a rural population that is fast going online to the resourceful teens in urban slums, the lower income demographics are choosing to buy internet, through small but recurrent amounts, which enable them to straddle the line between affordability and aspiration. Instead of providing limited internet for free, we need think of ways to improve access to internet which today is limited for many. The 10 Rs recharge for talk-time or similar small amounts for data recharge need to be understood as more than a mere limitation of spending capacity. I argue that they are directly related to the insecurity borne out of the state of transience that informal settlements exist in. This transience manifests itself as lack of longer term planning in the psyche of its residents and consequently, their economic decisions. This is apparent through the case of Savda Ghevda formed during the 2000s when thousands were forcefully evicted from JJ clusters within the city in the name of city ‘beautification’ for the Commonwealth Games 2010 and resettled here, far removed from their source of livelihoods. Despite being ‘planned’, basic services in resettlement colonies such as electricity, piped water supply, sewage system and transport services follow much after the relocation, largely driven by what Solomon calls a ‘quiet politics’. An analysis of the infrastructure in informal settlements requires an understanding of the politics of distribution. Like in most other informal settlements, electricity was the first infrastructure to arrive in Savda, largely due to the profit driven motives of ‘discoms’ . Installation of electrical meters is much awaited in informally organized areas due to the address proof an electricity bill provides, marking the first step towards formality. There is, however, still no public sewage or water system in Savda. Unlike in Govindpuri or Jagdamba which have community points for water supply, here the community gets its water from DJB water tankers every day. Though the water is free, its supply is insufficient and erratic – with people having to plan their daily lives around tanker timings, lining up for their daily supply just as they buy their daily digital dose. Some have now also dug borewells jointly and buy drinking water from ‘water ATMs’ at 30 paise a litre. Though the community is fast converting from feature phones to smartphones, the only second cellular tower was removed recently from the terraces of one of the houses, based on the neighbors’ complaints of health hazards from electro-magnetic frequency (EMF) radiation – a common symptom of the expansion of telecom infrastructure in Indian cities. Ensuring a state of transience in informal settlements can be seen as a deliberate measure by the government if we were to look at the nature of land titles. Plots in resettlement colonies in Delhi were provided on a conditional lease of 99 year leasehold in the case of the earlier colonies during the 1960s to only 7-15 year terms more recently. In Savda Ghevda, plots were given to families on a 10 year lease without any ownership rights over them. What is to become of the houses built on these plots over the last decade now that the lease is going to expire? Most likely, it is speculated by the community, the lease would be extended by another ten years – and then, another 10 years – like the water tankers that make their way to the settlement day after day, as they have done over the past decade. The 10Rs recharge amount as a unit speaks not only of the diurnal rhythm of digital consumption but also the limited access to services in similar areas. The community is locked in this seemingly perpetual cycle of ephemerality which limits its growth and ability to plan ahead. On one hand, the 10 Rs recharge represents the unit of purchasing power of lower income populations that are fast going online while also defining the patterns of insecurity and transience that they live in. Just as the absence of adequate resources in informal settlements is leading to the emergence of creative solutions and entrepreneurial networks, covered in my second post, in the form of low cost, low tech urban infrastructures which bypass formal mechanisms. An appropriation of digital technology has taken place here through the ingenious amalgamation of OTG or On-the-Go devices, which on their own are rudimentary. This hardware of cheap China made electronic accessories is complemented by the parallel informal network of pirated digital content. Alongside this nexus exists the spatial net of the kirana phone recharge shops operated by local entrepreneurs. Lobato and Julian talk of similar informal media entrepreneuralism within the web of which the recharge stores can be seen as public hubs for data recharge and digital content. Intersecting with this are the new sharing networks forged between different demographics and the communal hubs of digital exchange set up. New embodied spaces occupy street corners and stairwells, offering freedom from and privacy within the dense fabric of informal settlements with constrained facilities. The day by day mobile recharges, purchase of downloads or video game coins feed into and emerge from the lack of services and their irregular supply in the low-income areas. The insecurity and impermanence of basic facilities and land tenure can also be seen to manifest itself in the architecture of the houses here – from the materials to the technology used. The housing structures are built with light materials such as corrugated tin for roof and brick walls without any mortar to bind them, eveready to be relocated again. Even in the case of the more permanent structures built in concrete frames with brick walls laid with mortar, the roofs are often made of stone slabs resting on steel beams in an architecture that is insecure – that can be dismantled, relocated and recreated. The digital matrix providing this community its daily entertainment, information and communication exists as an innovative system of devices that are repurposed, shared and appropriated – just as the settlement itself exists as an OTG structure. Instead of the urban A class SEC (socio-economic classification) outlets, they distribute their products in the lower income neighborhoods of B, C and D class outlets which are not covered by national brands such as Frito-Lay. Laid out as per the bye-laws for resettlement colonies in the Master Plan. See Bhan, G. (2013, June 15). Planned Illegalities: Housing and the ‘failure’ of planning in Delhi: 1947-2010. Economic and Political Weekly , XLVIII (24), pp. 58-70. See Lobato, R., & Julian, T. (2015). The Informal Media Economy. Polity.